When the original 1964 production of Fiddler On the Roof premiered on Broadway, the character of Tevye, a struggling, big-hearted, Torah-quoting milkman from the Russian shtetl of Anatevka, moved into the lexicon of Broadway theater's memorable characters. Of course, Tevya was already known to readers of Sholem Rabinovich, aka Sholem Aleichem, the “Jewish Mark Twain,” who wrote short stories about the vivid characters in the impoverished Yiddish-speaking villages of Russia. Under the sensitive leadership of director/actor Joel Grey, Fiddler remains as touching as ever, with the book by Joseph Stein and the music by Jerry Bock with Sheldon Harnick’s lyrics. Tevye explains the title. "In our little village of Anatevka, you might say every one of us is a fiddler on the roof, trying to scratch out a pleasant, simple tune without breaking his neck." What keeps them balanced? One word; "Tradition." But, Tevye warns, "It isn't easy." 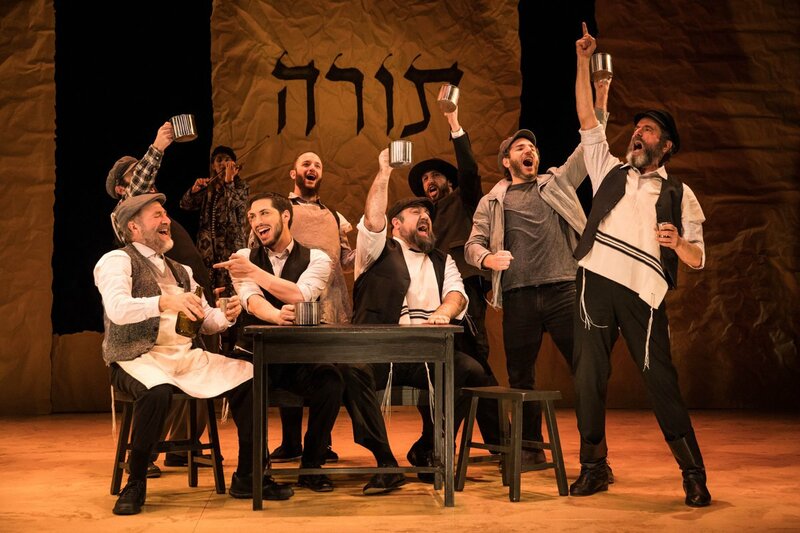 The National Yiddish Theatre Folksbeine’s revival of Fiddler On the Roof at Stage 42, was translated into Yiddish by Shraga Friedman. But take it from me, you don't have to understand Yiddish to appreciate this extraordinary work about surviving the upheavals of life. I don't know Yiddish, except for the few words I picked up growing up in Brooklyn. You can glance at the Supertitles in English and Russian (the Russian Jews' second language, spoken only to Russians), but the show is as authentic as the language heard on the streets of Borough Park. Tevye is played by the remarkable Steven Skybell, his physical and facial expressiveness telling the story with nuance, depth and irony, yet never over-the-top, as his life is about to unbalance in several ways. First, three of his five daughters reject the traditional matchmaking in favor of love. The eldest, Tsatyl (Rachel Zatcof), is promised to a well-off, much older butcher, Leyser-Volf (Bruce Sabath). However, she loves a poor tailor, Motl (appealingly played by Ben Leibert) and she tearfully cries to her father that Motl is the man she wants to marry. Tevye, beneath his man-of-the-house bluster, is really a softie. He concocts a zany fake dream segment convincing his wife, Golde (Jennifer Babiak), to allow their child to marry her true love. His second daughter, Hodl (Stephanie Lynne Mason) falls in love with a political revolutionary, Pertshik (Drew Siegla) and when she insists on following him to a Siberia prison camp, Tevye again gives in. The goodbye song she shares with her heartbroken father at the train station, “Far From the Home I Love,” is the show's most poignant ballad. Yet most difficult for Tevye to bear comes when their third daughter, Khave (Rosie Jo Neddy) chooses Fyedke (Cameron Johnson), a Russian - a non-Jew! Tevye, devastated, turns his back on Khave. Near the finale, however, he manages to whisper "God be with you" in the last moments before they are separated, probably forever, as all the Jews in Anatevka are evicted and must immigrate to new lands. Sharing his travails are his solid and forbearing wife, Golde. She is given a likeable portrayal by soprano, Jennifer Babiak. Comic actor, Jackie Hoffman delivers a more likeable, lower-keyed Yente, the pushy matchmaker. A graceful Lauren Jeanne Thomas, plays her violin as Der Fidler, as she deftly shadows the action. The supporting performances are all enlivened with depths of joy, fear and sorrow. Staging by Joel Grey is spare, with set designer Beowolf Boritt's creation of the schtetl with brown paper backdrop bearing one word "Torah." Ann Hould-Ward's costumes are in drab earth tones for the village Jews. The Russians are differentiated by their bands of red. The music is stirring with emotion, exuberantly celebrating, "To Life," and Motl's joyful "Miracle of Miracles" when he learns he can marry Tsatyl, to the poignancy of passing time with "Sunrise Sunset." The humor of "If I Were a Rich Man" (changed to "If I Were a Rothschild") remains an audience favorite as does the famous Bottle Dance. Sta? Kmie? bases his choreography on Jerome Robbin’s original dance designs. The vibrant 12-piece orchestra is conducted by Zalmen Mlotek. The heavy rhythmic pace of "Anatevke" accompanies the exiles as they leave their homes, dragging along their possessions. Before Tevye exits the stage, he turns back to Der Fidler and signals her to join them, a wry reminder that the slippery balance of tradition remains. Running Time: Two hours, 50 min. One intermission.